Wendy had fun ghost-writing the initial version of this post, which I then edited. I thought she captured my style quite well. The trip was a true partnership, with her taking notes each day which she would share with me, these posts mixing in her photographs with my own, and now me revising her first draft into this final post. So, although written in my voice, this post, like our trip, was a true collaboration. 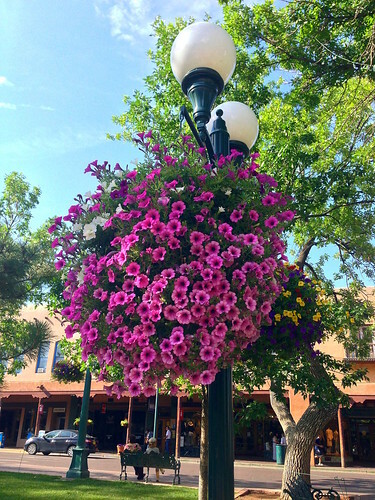 After spending the previous evening strolling about the Plaza in Santa Fe, Wendy and I decided the next morning to walk the few blocks from the Luxx to the Plaza and seek out the historic Plaza Cafe. I had tried to eat there for the last couple of years, only to find it closed by a fire. Happily, it was back in business after a million-dollar renovation. 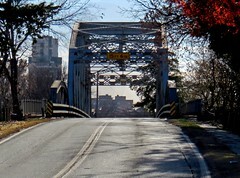 I had the works – pancakes, bacon, scrambled eggs, and sausage, while Wendy had a large order of steaming biscuits and gravy. “This is waaay better than McDonalds!” she quipped. Afterwards, we relaxed on a bench, admiring the many flowers draped about the Plaza. The weather was cool with a slight breeze as we wandered around, pacing by the silver and turquoise jewelry the merchants were busy displaying on blankets on the veranda in front of the Palace of the Governors. 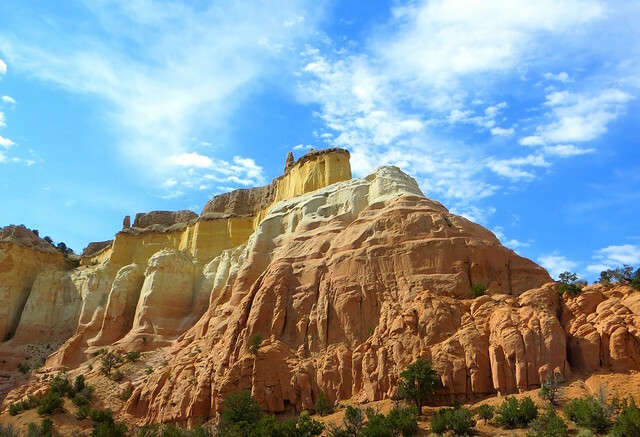 After building up our energy, we headed up US 84 to hike at Ghost Ranch near Abiquiu, New Mexico. I loved hiking there last year and was eager to share the experience with Wendy. We checked in at the Welcome Center and, returning to the car for our packs and sunscreen, we heard thunder in the distance as a storm approached from the west. My iPad’s RadarUS app showed the storm would likely pass just south of us. The high temperature and threat of lightning led me to abandon a hike to Chimney Rock, opting instead to head as far up the Box Canyon Trail as possible, bearing in mind the weather in case of a flash flood. We would end up hiking four miles. We walked past the various buildings, including the old Ghost House, with its characteristic cow skull. After an arduous trek up a red hillside toward the Box Canyon Trail, we were covered in sweat and stopped to rest in one of the little hogans. 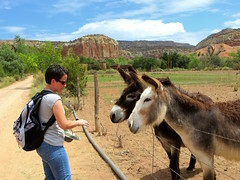 Farther along the road were some cute burros, which Wendy enjoyed petting. As we headed up the road toward the Camposanto, the cloud cover increased and the wind cooled off. The panorama was spectacular, with gray clouds over Cerro Pedernal and an impressive cloud bank beyond Chimney Rock. Near the memorials were cholla cacti with hot pink blooms. We trod past the high wall of the Camposanto, onward to the Rito Del Yeso arroyo. We followed the Rito Del Yeso up the box canyon, with the lower portion of the little stream drained dry by the water collection system. Wendy examined the clay layers in the eroded walls of streambed. Above the collection dam, we began crossing and re-crossing the stream along the bumpy and demanding trail. The overcast sky made for less-than-ideal photo opportunities, but thankfully kept us cool. I kept my eye on the sky, alert for pathways to higher ground if it began to rain. We reached the side stream, stopping for a photograph. Encountering many colors in the streambed, we squished through muddy crossings on the trail. Wendy discovered a black inky substance coming up through the mud, and I stopped to take a video of the foul-smelling fluid as it bubbled up from under her shoe. By this point, in my mind I hear Wendy protesting, “They are going to be sick of seeing photos of me. Put one in there of you.” So I’ll throw in a pose she had me strike on one of the canyon rocks. I’m surprised the picture isn’t blurry from her laughter as she took it. 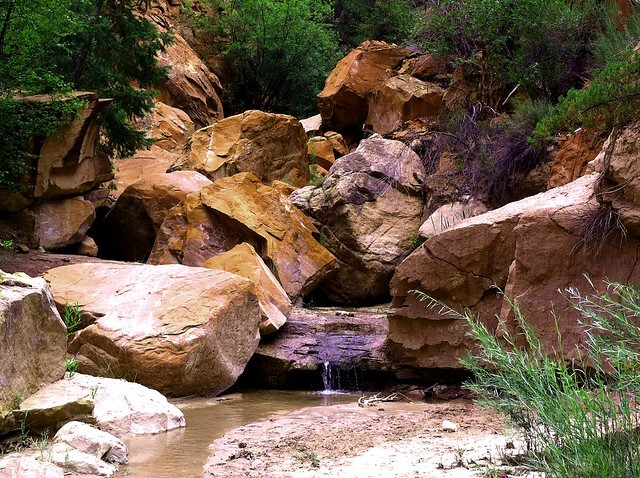 The Box Canyon Trail is a fun hike of varied terrain. Our waterproof hiking boots served us well. We developed a habit of stepping gingerly upon large stones, making our way across the stream. This careful balancing act worked fine until we reached a cleft where the trail climbs over a large steeply tilted rock slab. Last year, a rope helped one up the slab, but it was gone. The only other way to continue along the trail was to go across a long tree trunk, which lay across the trickling stream. Intimidated at the thought of trying to walk across the log like Olympians on a balance beam, Wendy and I decided to scoot our way across, crawdad-style. We were braver on the return, however, carefully stepping along the log to cross. We finally reached the end of the box canyon, surrounded by the high cliff walls of the mesa above and beyond. We relaxed on a stone slab, enjoying pistachios and Paydays. Red water seeps high up on the walls created trails of moss, and the textures and colors of the varied rock surrounding us were intriguing. Finally we clambered over the large boulders to retrace our steps to our car, pausing by a pool to capture a reflection of Kitchen Mesa, with clearing skies over Cerro Pedernal in the distance. A posted trail map renewed my determination to some day hike the Kitchen Mesa trail, but it was time to head onward. After a break for ice cream and wi-fi in the Ghost Ranch Welcome Center, we headed north a few miles to the Echo Amphitheater. Its colorful layer cake geology is fantastic. Wendy laid back on the ground to capture her shot. She also took a great shot of the desert varnish streaming down the walls of the bowl. We clambered up the slope, feeling the effort after the tiring hike at Ghost Ranch. Rain wash had covered portions of the trail with sand. 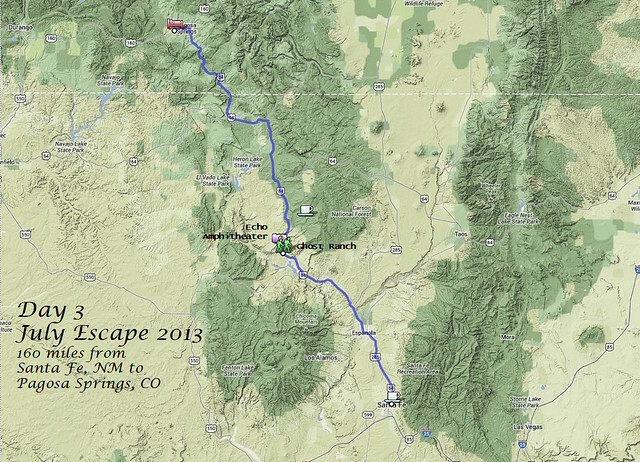 We briefly created our own echoes until a group of college-age kids came along, prompting us to head onward toward Pagosa Springs, Colorado. As we crossed the border into Colorado, Wendy shared my enjoyment of the change in biome, with us coming up over a hill to see layers upon layers of blue mountains in the distance, the sort of shot you’d expect in a Windows desktop background. It was a magic moment for her, with the Simple Minds song playing in the background proclaiming, “…rain keeps fallin’, rain keeps fallin’ down, down, down, down…” The cool nearby rain had made our afternoon hike feasible, and cool rain would return in a couple of days along our train ride through the San Juan Mountains. We had dinner at the Pagosa Springs Brewing Company. Service was very slow, and I made the mistake of ordering fish and chips; I should have just ordered chips. But Wendy enjoyed her “Colorado Cuban” sandwich. After a somewhat arduous day, the spacious hotel room at the Pagosa Springs Inn and Suites was a welcome relief. It would recharge us just enough to make it through the next day around and about town. 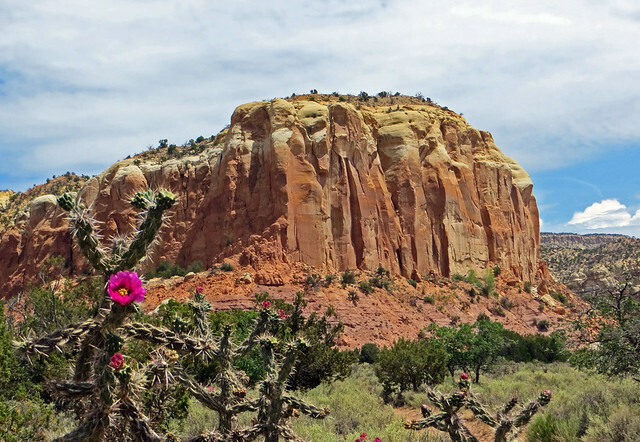 I was at Ghost Ranch last week too! Took some of the same pictures including one of that burro with the white face. 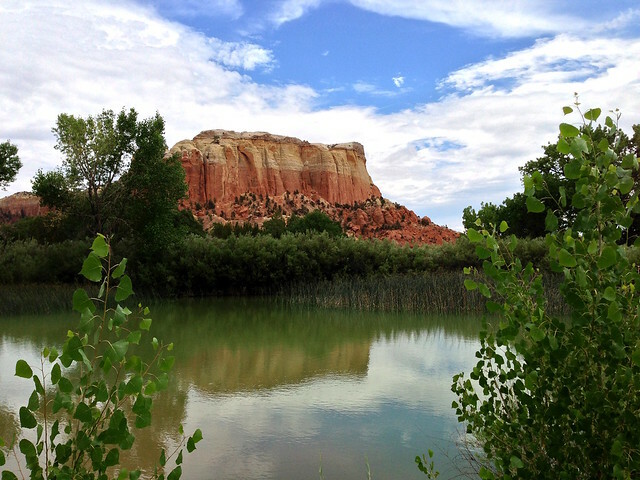 Love that view of Kitchen Mesa behind the little lake. It was a great trek into the Box Canyon.